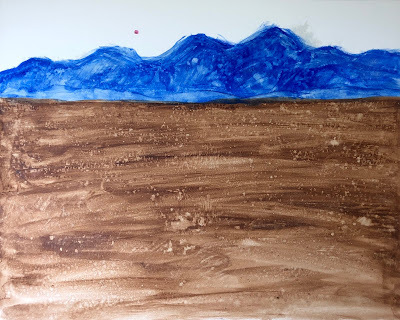 I started another painting today, a mountain landscape created with acrylics used as watermedia. These paintings are based in imagination and memory. Like some of my most recent paintings, this is a more specific memory. I grew up in Pueblo, Colorado. The mountains were about 30 minutes away (Beulah, San Isabel, Colorado Springs) and going to the mountains was infrequent and a treat when I was a kid. But those mountains were always visible in the distance. When I left Colorado, I realized that those distant mountains were in my mind's eye, and that I would always be looking for those mountains on the horizon.